It looks like a suicide note to me. Monsieur Revoy haz vworked verrie longue! 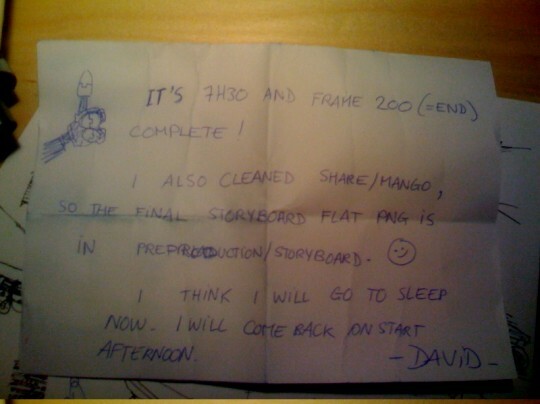 Now it’s your responsibility to make it into a film Ian..
Go get some rest, David! :P …though of course, with the 6-hour time-difference between here and Amsterdam, you’re probably up again already. Ok, but is no one going to ask what that thing up the top left corner is?! This was really a huge task, I corrected 150 colored speedpainting frame for the storyboard during all a long day before I wrote this message. Woah, 150?! That’s quite a huge number, kudos to your work!